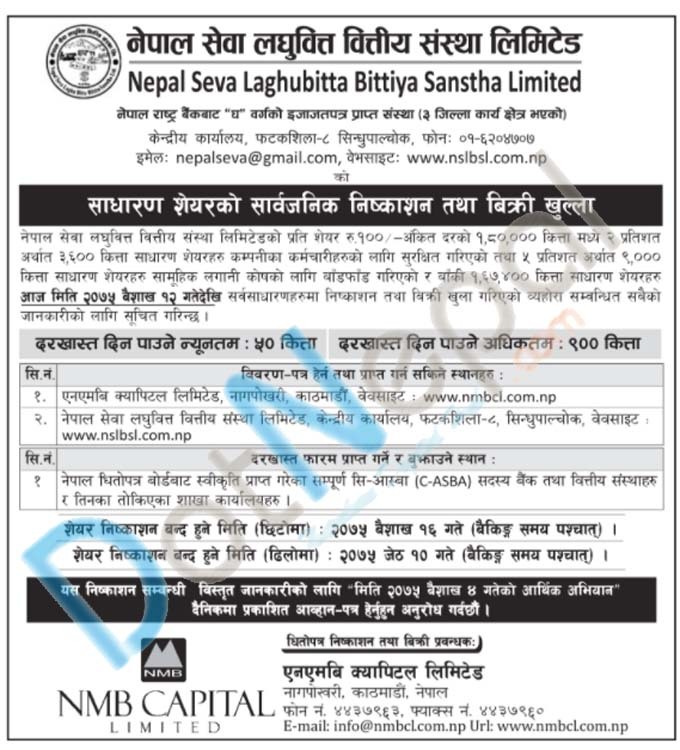 Nepal Seva Laghubitta Bittiya Sanstha Limited is issuing 1,80,000 units IPO shares to the general public from today (12th Baishakh, 2075). The applications can apply minimum 50 kitta to maximum 900 kitta shares. This Micro Finance is regarded as the best available tool for poverty alleviation through financial services to the low income group and is a mechanism of social intermediation. It focuses on providing employment to poor and disadvantageous group of the society. It is emerged as an important financial intermediation of formal, semi-informal and informal sector. Thus micro-finance has been considered as banking with development tools.